The mountain of Oni legends. The views from the entire mountain are good, allowing for visitors to look out over the surrounding mountains. This is actually a range of mountains consisting of Mt. Senjogatake, Mt. Hatogamine, and Mt. Nabezuka. There are 3 mounting hiking routes. 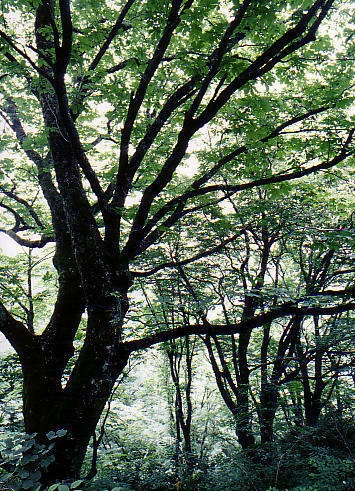 There is a broad leaf forest, consisting mostly of beech trees, in the area of Onitake Inarijinja Shrine. Take train to Oeyamaguchi-naiku Station on the Kyoto Tango Railway, then take City Bus bound for "Oeyama no Ie" to the last stop. It is then approximately a 1 and a half hour walk to Onitake Inarijinja Shrine. 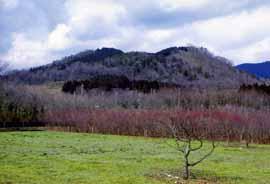 One of the Mt. Oe mountain chain. Located in the southwest of Mt. Oe. Mt. Senjogatake can be overlooked from Mt. Akaishi, and there is a 360 degree panoramic view. Prepared mountain hiking paths are available. The course leads to Mt. Oe. 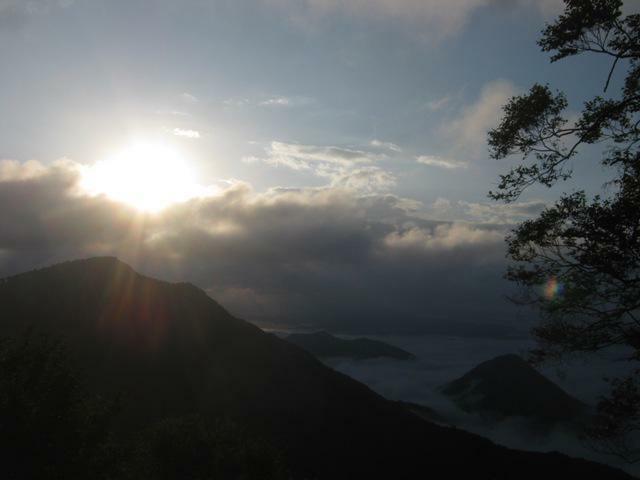 The mountain can also be hiked from the Amaza Haitani Forest Path and the Yosano Town side. (Haitani side) 1 hour walk from the Tankai Bus "Ippon Matsu" bus stop to the start of the trail (Using the Haitani Forest Path). A cone-shaped mountain. 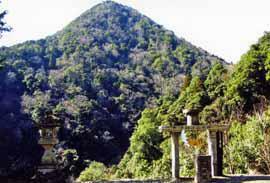 This mountain is a symbol of local religious faith, and can be prayed to from the Motoise Naiku Shrine. 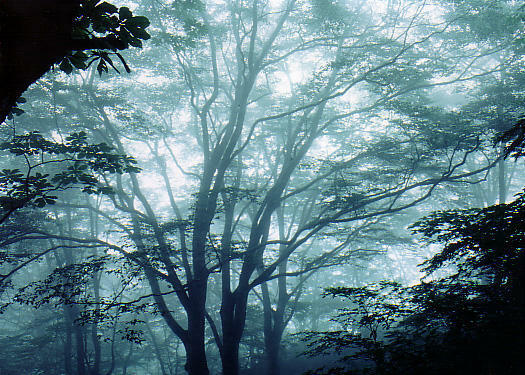 The area was designated a Kyoto Prefecture Historical Natural Environment Protection Area in 1984. There are no hiking paths. Take train to Oeyamaguchi-naiku Station on the Kyoto Tango Railway and then walk for 20 minutes to reach Motoise Naiku. Legend says that Minamoto no Yorimitsu came here to pray before he went to drive out the oni. 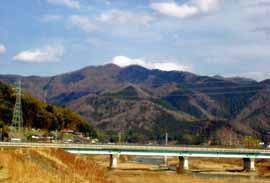 This is the highest mountain in Fukuchiyama and offers great views. There are mountain trail starting points from Mitake Seishonen Yama no Ie and from the Sasaki side. Sasaki side: Take the Mitake Bus to the "Hotokesakaguchi" bus stop, then walk 10 minutes the start of the trail. The Yakuno Tour of 88 Stone Buddha Images revolves around mountains. 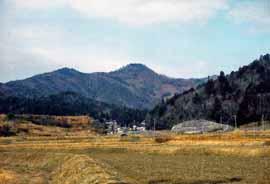 The peak provides a full view of the Yakuno plateau. This is the only volcano in Kyoto Prefecture. Takarayama Park is located at the base of the mountain. There is also a carefully maintained vehicle road that leads near to the mountain peak and a 2 m wide walking path. 20 minutes' walk to the start of the path from Kami-Yakuno Station on the JR San'in Main Line or the City Bus "Nojo no Sato" bus stop. 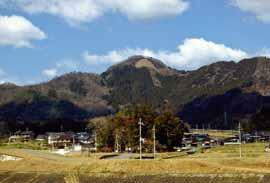 It is said that the oni Ibragi-doji lived on Mt. Onigajo and the oni Shuten-doji lived on Mount Oe and that they both caused ruin and destruction in the neighboring areas. From the peak one can see from Mount Oe to Fukuchiyama City and there is a gazebo located near the peak. A hiking trail is available from Murodanisan Kannonji Temple in Oecho. Visitors can also traverse from Mt. Karasugadake. 40 minutes' walk to Murodanisan Kannonji Temple from Kyoto Kotsu Bus "Yamanoguchi" bus stop. From the peak one can enjoy a complete view of Fukuchiyama City. Visitors can also traverse to Mt. Onigajo. The mountain is also home to a TV relay station, and visitors can view Mt. Karasugadake from the Fukuchiyama city area. 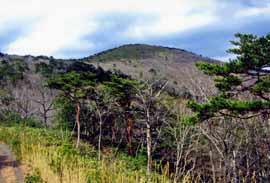 There is a forest path to the peak available and also a mountain hiking path from Innai. 30 minutes to the trail starting point from the Kyoto Kotsu Bus "Innaiguchi" bus stop. Legend says there was once a castle at the top of the mountain and there is a legendary love story about the castle lord's daughter and his chief retainer. 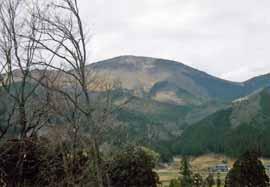 This mountain is the site of the "Tanba daimonji" bonfire. From the mountain one can view the city area of Fukuchiyama, and there is also a hiking trail from the Choanji Temple side. 20 minutes' walk to Choanji Temple from the Kyoto Kotsu Bus "Handa" bus stop. 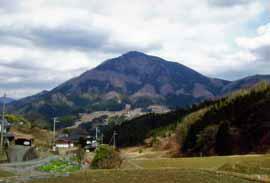 This mountain is called the "Tanba Mt. Fuji" and there are ruins of a castle at the top. 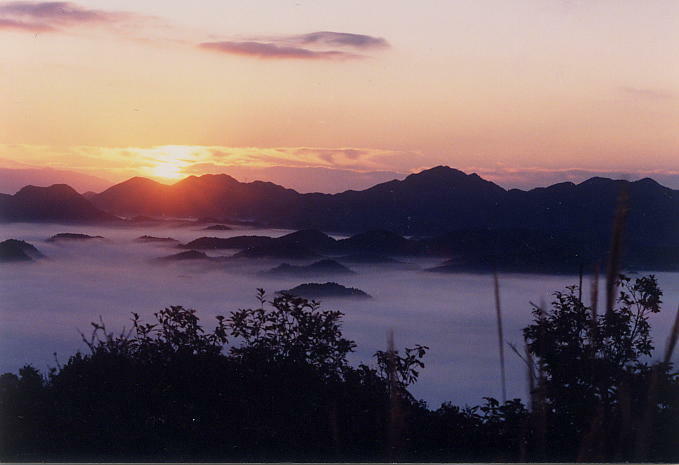 The view allows visitors to see as far as the area around Yakunonukata and there is a hiking trail from Komaki Village. 5 minutes' walk to the trail starting point from the Kyoto Kotsu Bus "Komaki" bus stop. 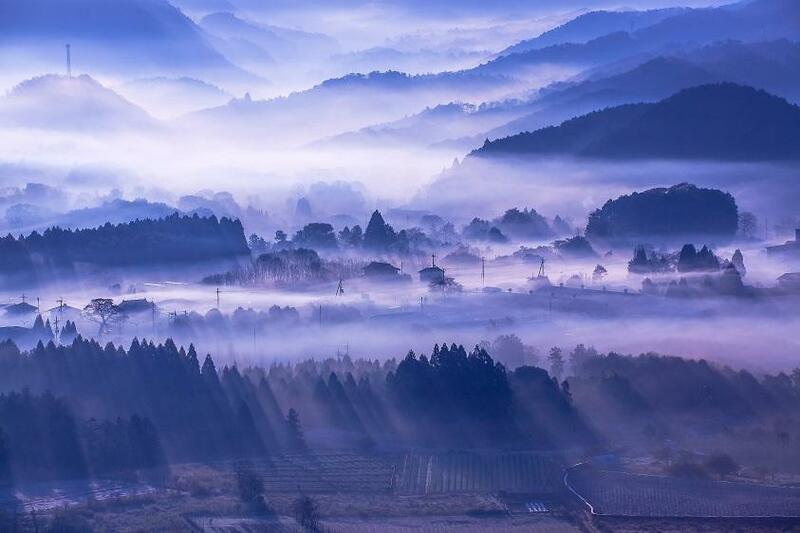 This mountain has long thrived as a symbol of faith, with many temples and shrines thriving here since the middle ages, and is also the site of a New Year's mountain hike on January 2nd every year. The top of the mountain offers a 360 degree panoramic view of the surrounding mountains. Mountain hiking paths with multiple courses are available. (Ubara route) 70 minutes' walk from the JR Bus "Ubara Shimo" bus stop. (Nakade route) 5 minutes' walk from the City Bus "Nakade" bus stop.